The Occupational Science and Occupational Therapy Program at the University of Toronto is guided by the Department’s Vision, Mission and Values, relevant evidence-based theories and practices, the accreditation standards of the Canadian Association of Occupational Therapy in Canada, the Minimum Standards for the Education of Occupational Therapists 2016 of the World Federation of Occupational Therapy, and the performance expectations for “competent” practice of occupational therapists as detailed in the Profile of Practice of Occupational Therapy in Canada (2012) and in the Essential Competencies of Practice for Occupational Therapists in Canada (2011). These materials provide the foundation for the program objectives and evaluation, curriculum planning, management and evaluation and the culture of educational scholarship in the Department. Refer to the materials below for a detailed explanation of our Educational Conceptual Framework and the complete MScOT Program and Curriculum Document, including the Professional Conceptual Framework. Watch this video, presented by Dr. Deirdre Dawson, Vice Chair of Education, to learn about the resources available on our website that will introduce viewers to our program, curriculum, and underlying philosophies and theories that shape them. 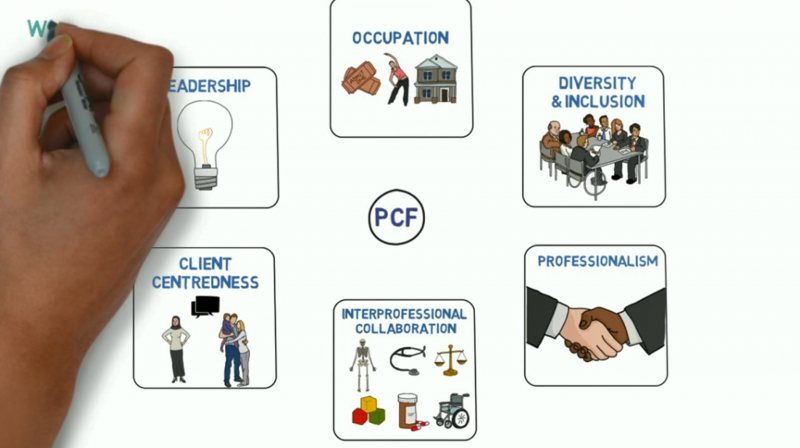 This animated video also presents an overview of the OT curriculum and the theoretical frameworks that shape it, specifically for those considering applying to the program. Produced by MScOT students Moira Ruthralingham & Brett Hnatiw.